Adam's Comment: Since this is one of the first transcriptions that I put up on this new site, it may need a little bit of an introduction. About 3 years ago a group of us began to have dreams and visions that were often confirmed by future events. Since then I took some time off and started a new relationship and we currently have a 2 year old child. As a result I could not do many transcriptions. When I took the time off, most of the people that were following the transcripts and prophecies moved on. In other words the ship sank and the forum came to a standstill. Much has happened since then and I am now ready to rebuild the ship. I had this dream on December 23rd and translated it on December 24, 2011. Then I got busy and forgot to post it. 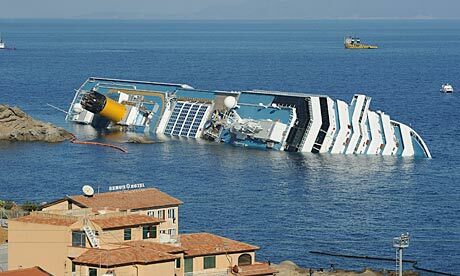 That was a big mistake because it was another prophecy with many similarities to the ship that recently capsized near Italy. When I saw the news about it, it didn't even click then. At the time I realized it was miraculous that most of the people were saved and the ship remained suspended on the rocks. Today while I was working on something else, Linda reminded me that I had not posted the last translation. So this is another confirmation that the transcript was sent from God and that he is still guiding us. Because I did not post the dream, it may be hard to believe that I did the transcript weeks before the incident happened. There are many similarities to the event and the transcription. You can see a picture of the file properties of when the dream was transcribed below. I had a dream where I was at an old archeological site. There was the chief archaeologist who said that at one time there was a boat buried at a location. He showed us the location where the boat once laid. I saw its outline. He then chose me to show him where the kitchen would have been located on the boat. He gave me a long white stick and told me to lay it down where the kitchen would have divided the rest of the boat. I jumped down in the pit area and immediately went to the front of the boat, because I was not sure. Then for some reason I realized it would have been near the back, so I went back and laid the stick down closer to the stern. The person in charge said that I was right and the other people standing around were happy I got it right. This dream came to me on December 23, 2011 and I transcribed in on December 24, 2011. 1. This is your architectural history which we will begin soon. If you accept it your future will be very good. The people that are standing around the outline of this ship are on a mission to see where you will be in the future and where you have been in the past. You are given this problem to solve now. 2. We know there has been confusion in developing and organizing the transcriptions in your book so we will guide you on your mission. What is the reason that the kitchen is at the stern of the ship? Its purpose is to ensure that all the people on the ship receive spiritual food to eat when they feel a hunger for religion. Each of them will find a reason to replenish the hunger that they have. 3. When there is a ship of religion, you will often have to first deal with the problems on the river of life and when your ship passes through the confusion that the current can cause, your soul will need spiritual regeneration and you will need to get the food and eat. Adam you can't forget the river will still get rough in the future. 4. This man has instructed you to place a line where you would separate the kitchen from the rest of the boat so there would be no confusion where you were while you are on this mission. Your mission is very unique. This journey needs to evolve spiritually and is especially not easy for the captain because he has a responsibility for everyone that is with him. 5. His work is to steer up the river and guide the ship and he may not be able to eat each time he is hungry unless someone takes over and assumes command for him. This archeological dream was sent to help reverse the confusion. The captain of this ship will return to assume command. We will see how he will make some decisions soon to avoid some evil and confusion. 6. What is the reason confusion is present on the river that we will encounter? We must think of the visionaries that have been with him at the beginning of the journey. Most have left him and went swimming in the rivers of life. Each dream they posted is the original beauty and historical construction of this boat. 7. When the visionaries began to build this beautiful religion they knew it was for others and they would become part of history. Adam has spent countless hours transcribing the dreams they have given for this original structure. When we build something beautiful, we should not pretend that we didn't do it and each person who was involved in its original construction should go down in history. 8. Each of the visionaries who were involved in the beginning have moved on, but Adam has chosen to return to the ship and begin its reconstruction. Each one of the visionaries who left the ship have taken with them very good skills that might prevent confusion in the river of life while they are swimming it. They will often find reason to use these skills. 9. Every new mission they have in the future will allow them to draw on some of the skills they learned in this religion. Some of the visionaries will be constructing things that are not coming from this religion in the future, for they have not found a reason to listen to the direction of God. This doesn't mean that they weren't involved in first creating something that was beautiful that will go down in history. 10. So God he will not erase the good things they have done, however, the original structure will be used as an outline. Adam will have to rebuild it from the beginning for he knows its construction. So Adam will soon begin restructuring this religion with the help of the angels. 11. The original ship crashed on the rock of evil and sunk to the bottom of the river. The captain did not have anyone to relieve him when he was spiritually exhausted. He needed someone in religion to steer around this evil when he was exhausted and God will assist him in its original construction. 12. He will send him some new visionaries to rebuild this ship. Adam has a vision of this religion which will help him bring in the new visionaries and it will become very clear to him as he rebuilds it. He will look at its original construction and build it so it will never crash into the rock of evil again. 13. The visionaries that will begin to help him will know from the beginning that they will remain on the ship until it reaches heaven, and they will be able to take command when Adam needs regeneration. They will be able to follow the direction that Adam has been given by God, while he is away. And they will trust that Adam will be able to steer around the evil in the future when they are confused. 14. God did not make him captain of the ship without a reason as he knew he had a mission that came from God. There are many things that will deceive you on the river of life and God didn't expect Adam to go down with a sinking ship. For if he did, he would not be able to build a better one. 15. The beautiful architecture of the structure will be maintained, but it will be much stronger and easier for people to find. We promise you it will happen and soon the plans will be revealed. We will be able to use many of the dreams and visions that the original visionaries had, with slight alterations. These alterations will not change the direction that God has chosen to take you. 16. The changes that are visible will assist in avoiding the confusion in the river resulting in procedures that will develop a stronger and more comfortable ship that visionaries will choose to remain on. We won't be short of people who will help to prepare the food of religion and everyone will have less reason to swim in the rivers of life, for they will have everything they need on the boat. 17. We shall see there will be many reasons to have faith in this religion, for it will bring rewards in the future. Each new visionary will receive a vision of this religion that will be presented in a fashion that God wanted. It will represent a beautiful collection of dreams that were sent to His visionaries for building a vessel that He designed. 18. It will have lessons for teaching visionaries the construction of His religion and how to reverse there emotional and religious evil. It will open their mind to the beauties in heaven and prepare them for a union with their God. It will lead to prophecies that they will see happening while they are part of the religious journey. 19. What was the reason that Adam placed this white board in the outline of this ship? It represented a line that will separate God's religion and spirituality. We will make progress if we understand the difference between the two. We know that spirituality is dependent upon what we believe and we know that religion is dependent on the people that influence us in our life as well as the culture we choose to accept. 20. We also know that it is impossible to get to heaven without the both of them. Each of them are important to maintain an eternal soul. Your journey depends very much on the structure that humanity has built for you to ride on the rivers of life. And each of us does not have a choice to ride on top of the rivers of confusion and evil. 21. However, we do have a chance to ride in a vessel that will help to protect us from being overcome by evil for an extended period of time. You have to think about a future that is void of any evil and confusion and one that is filled with love and beauty. We know this vessel will get you there. 22. We know when we cross this line from spirituality to religion, that we will be replenishing our physical body with physical things that we will need for survival. For many do not really understand that our cultural disposition often defines how we can physically survive in certain regions of the world and this is the basis of most religions. So in other words, religions are constructed to the way humanity defines them. So how is any religion void of any evil? A true religion can only come from God. 23. Your God accepts that your religion is very important to all of you. Therefore he gives you the right and expects you to believe what you have been taught for He knows you need it for survival. However, if you are missing His spirituality and spiritual nature, you will not be able to accept His love. If you are not able to see the line between the two of them, then you will always have confusion of where you stand with God. 24. There is a reason this line divides the kitchen into a smaller portion of this ship. God knows that most of you will be using the rest of the ship more while you are walking in His spirituality. That is why religion only takes up a small portion of the ship, even when you are on the boat of religion. 25. If you always have need to stay in the kitchen, you will not be able to function properly in His spirituality. If you don't return to the kitchen, you will not be able to replenish the physical body that carries you in spirituality. 26. We shall have a prophecy now! Each new visionary of the future will see how spirituality is evolving when each new prophecy begins to unfold. Each region that has resistance to religious evil will be able to reverse some evil and corruption that will save lives and prevent suffering. We will begin to see some of these miraculous events taking place soon. 27. It will result in saving millions of lives and it will be a direct result of God's spiritual nature. We will see how these miracles would not be able to be created through religious intervention. It may seem that this will be confusing in how we will determine how this miracle has taken place, but it shall be clear when it really happens and we will know that it is God doing it. 28. There will still be evil trying to interfere with our faith, but those who walk spiritually with God will know it is true. When they resist this religious evil you will expect to see a miraculous event happening soon. It will begin once Adam publishes the documentation which will result in bringing new visionaries to His Religion. 29. Like in the past, this prophecy, and many others will happen and they will be able to refer to them easily. They shall remember each event and clearly be able to testify to each of them. We will see when it comes. 1. The first line talks about where the religion has been in the past. That is one of the first things they wanted to find out about the ship and how it got off course. 2. The transcript talks much about the captain and his duties . Similarly there is much talk about the captain of the ship and what he was doing at the time the ship crashed. 3. In the transcription the ship crashed on the rock of evil. In reality the ship also crashed on a rock. 4. In the transcription the captain left the ship and had to return. In reality the same thing happened. So there are many similarities to the dream and the real event and another prophecy of survival. Sorry I did not live up to my responsibility as I should have posted the dream and transcription as soon as I had it. Here is a picture of the file adams_new_boat, which is the dream transcription and prophecy that was done on December 24, 2011.